The present work is a comparative study of the major Upanisads and Theravada Pali canon. It reveals remarkable similarities in ideas, parallelisms in thought, even verbatim similarities in the Upanisadic and Tipitakan phraseology on the issues like self and Non-self Karma and Rebirth etc. An attempt is made to find out the influence of the Upanisads on early Buddhist thought. It lays bare the grounds of rejection certain Upanisadic concepts at the hands of the Buddhist who remoulded and modified a few of them to suit their own expression of inward experience. It is devided into nine chapters. The first chapter introduces the work. Chapters second to eight deal with the problems regarding the concept of personal God, self and Non-self, Pancakosa and Pancaskandha, Karma and Rebirth, Aryasatya and Ariyasacca, Brahma cakra and Dhamma cakka and Epistemology. The concluding chapter is a résumé containing general remarks. The present work is approved by University of Poona for the Ph. D. degree, as also the following prizes—Nath Hari Purandare Prize, Zala Vedanta prize, I.C.S. Yardi Vedanta Prize, Natu Vedanta Prize and Pathak Vedanta Prize. The present work is the doctoral dissertation submitted by me to the University of Poona, for the Ph.D. degree in Sanskrt. This is an attempt to trace out the degree of influence of Upanisadic thought on that of the Buddha as presented in the early literature of canonical Buddhism. Buddhistic studies have become a major concern to scholars of oriental thought and culture and are undertaken in increasing proportion all over the world at present. In India the systematic study of Buddhism is a recent phenomenon. I often felt that any study of Buddhism is meaningless unless the very roots of the thought propagated by the Buddha and his successors are properly understood. It was necessary, therefore, to search into the antecedents of the advent of Buddhism. The asceticism preached by the Buddha must not have been a sudden event or at least must have borrowed some ideas and practices from the older a then living traditions much more known to us through the Upanisads. It is no wonder that Sankaracarva who revived the ancient Vedic tradition of asceticism is labelled although he had totally depended on the Upanisads for his life philosophy and mission. Perhaps, those who so labelled Sankaracarya did not realize that the roots of Buddhism itself are embedded in the Upanisads. 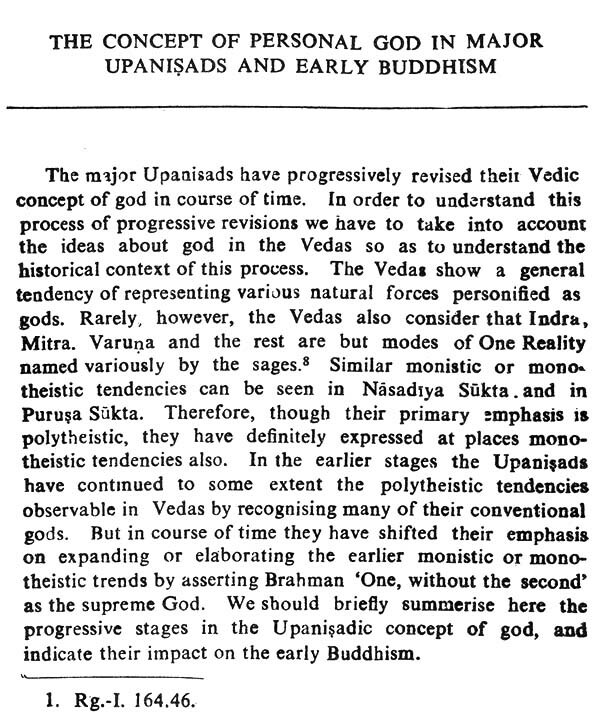 The present study is an humble attempt to hit at "Some Points of Contact between Early Buddhism and the Upanisads" which can be linked historically. I am aware of the fact that no material evidence is available in quantity enough to historically corroborate the literary evidence that has been utilised for the present study. The historians of early India, however, will not feel it out of place if a study of such a period is made 'dependent fully on the literary evidences available to us, and therefore, not to be ignored. To fill a gap in the missing links is after all to be expected of such an attempt of study. The subject of my doctoral dissertation was. "Some Points of Contact between early Buddhism and the Upanisads". The study aimed at a comparative and a critical examination of the major Upanisads and the Theravada Pali Canon from such points of view as self and Non-Self, Karma and Rebirth etc. The study revealed remarkable similarities in ideas, parallelisms in thought and even verbatim similarities in Upanisadic and Tipitakan phraseology. 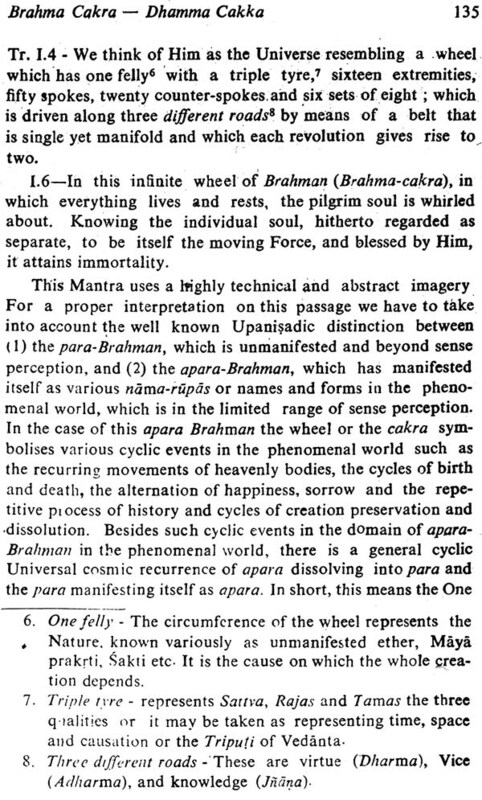 All these points evince considerable influence of Upanisads on early Buddhist thought. 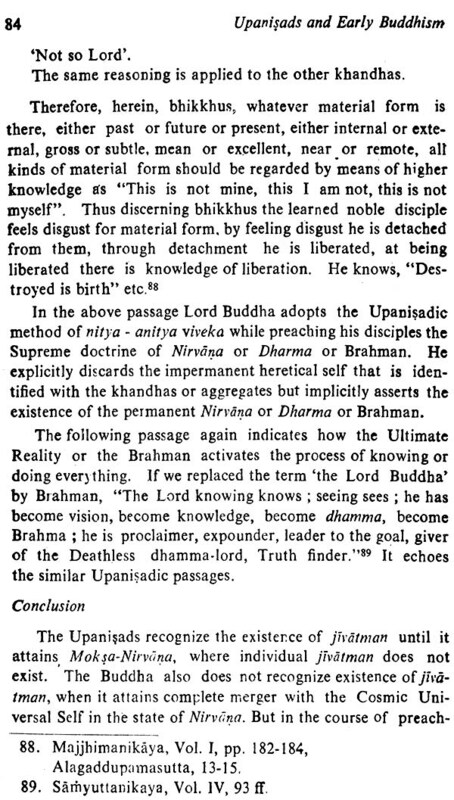 This should not be taken to mean, that the Buddha blindly and totally accepted the Upanisadic line of thought. He always subjected Upanisadic ideas to his logic and accordingly rejected certain concepts and remoulded and modified a few of the Upanisadic views to suit his own inward experience. It gives me great pleasure in expressing my heart-felt thanks to all those who have, in their own way, helped me in this work. First and foremost, I express my deep sense of gratitude to my guru-Prof. Dr. M.G.Dhadphale, a distinguished scholar of Indology and Buddhism and head of Sanskrt and Prakrt department, Fergusson College, Pune, who took keen interest in my work. Without his inspiring guidance and sustained encouragement, it would not have been possible for me to complete this project. I once again record my indebtedness to him. Dr.S.D.Joshi, Ex-Director, C.A.S.S., University of Poona has always helped and encouraged me. Prof. R.N. Dandekar and the late Prof. T.G.Mainkar gave me valuable suggestions. I thank them for their help. I cannot but empress my sincere thanks to Prof. V. N. Jha Director, Center of Advanced Study in Sanskrt, University of Poona. Puna, who often encouraged me personally in my research pursuits by providing me with the facilities and helpful environment to see the present publication going through the press. My senior colleague and personal friend Dr. Shiv Kumar Sharma of the C.A.S.S, has helped me in various ways, so I could see my doctoral thesis in its present printed from. I have no words to express my deep feelings of respect and gratitude towards him. It would not have been possible to get this volume published without his kind help. I wish to record here my sincere thanks to Dr. R.P Goswami, My personal Friend, well wisher and Librarian of C.A.S.S. who gave me valuable suggestions. Any two religions may be either unrelated or related mutually. The unrelated religions are usually isolated in time and in their geographical locations, such as Shinto of Japan and Islam of Arabian. These isolated and unrelated religions normally have nothing in common for comparison. If such unrelated religions perhaps contain any common elements it may be due to the fact that even isolated human minds may think similarly. For instance, the same or similar ethical and moral codes of conducts may be prescribed even in unrelated regions. As an example of related religions may be cited the case of Judaism, which later differentiated into Christianity about two thousand years ago and much later into Islam around Seventh Century A.D. All these three related religions, though now separated, still share in common some of the earlier religious texts such as the Old Testaments of Judaism. Therefore, it is possible to expose such related religions to critical comparative studies and then identify their common elements and contact points. 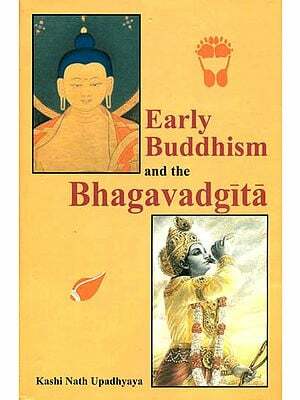 In the Indian subcontinent earlier Brahmanism and Vedanta differentiated into Buddhism after the birth of the Buddha 565 B.C. Therefore, these two religious systems are naturally very closely related. Most of the schools of Brahmanism accepted the final and supreme authority of the Vedas or Vedapramanya. As against this the Buddha neither expressly accepted this Vedapranninya nor denied it in definite terms. 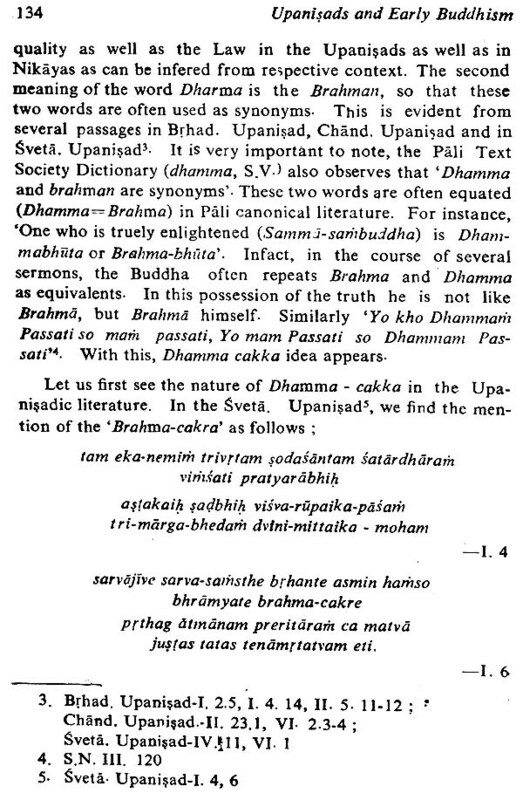 The acceptance of this Veda-pramanya was considered as essential for inclusion of new view-points in the older system; therefore, the Buddhism probably came to be considered as a separate religion. The Vedas were mostly pre-occupied with personification of various natural element or forces in the form of a number of gods, worship them with prayers to gain their favours .and perform sacrificial yajnas and other rituals for material gains in this and the next world. 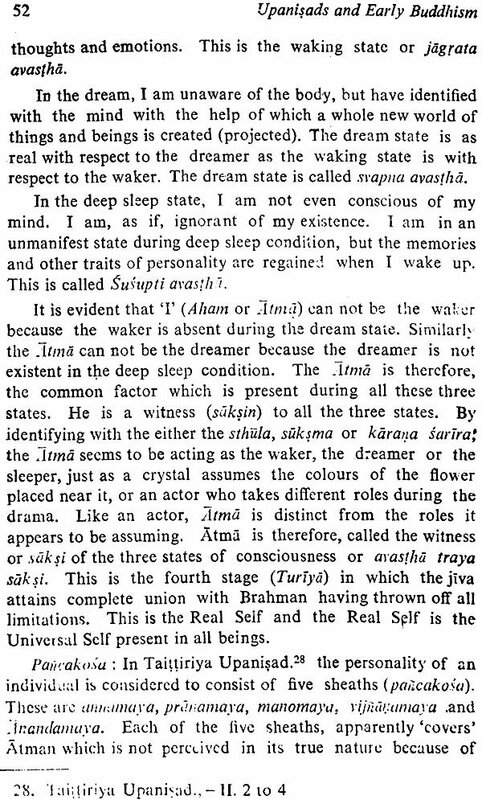 Though the Vedas are thus primarily motivated by such material aspiration they do occasionally express abstract concepts of highly philosophical implications, as for instance, the Naisadiya Sukta. It is these occasional abstract speculations in Vedas which infect provided the basic foundations for Upanisads which are highly philosophical or metaphysical in contents. The Upanisadic sages were very bold free thinkers. 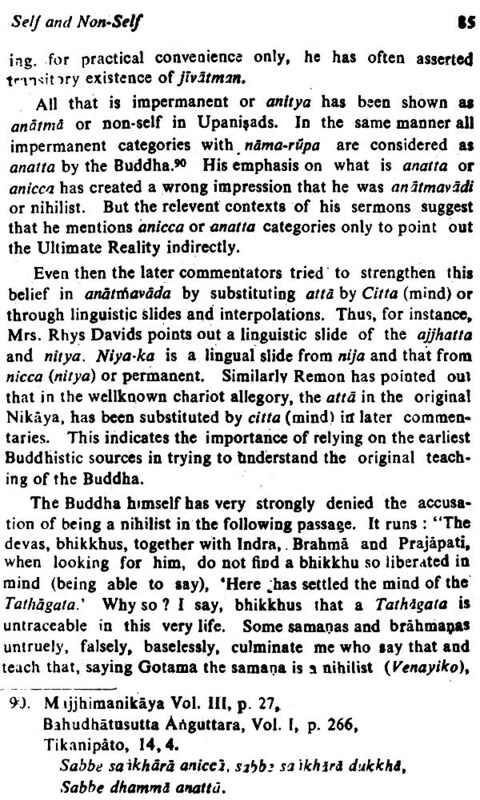 Though the Buddha did not identify himself with earlier Vedic tradition, there is ample evidence that he was considerably influenced by the major Upanisads. During his earlier formative period of spiritual pursuits he had come in close contacts with several teachers well versed in Upanisadic and Sathkhya philosophy as also yogic practices as given in middle and late Upanisads. His teachers included Alara Uddaka Rafnaputta and others. After receiving their guidance for sometime he temporarily left the company of these teachers during the period of his intense spiritual practices through his own self efforts leading to his Enlightenment or sarnbodhi. But soon after Enlightenment he was again very eager to meet them as he thought some of his earlier teachers who were still living, were wise, intelligent and were likely to comprehend his teaching very soon. In view of this back-ground, the influence of major Upanisads on his preaching can be understood. The object of the present thesis is to attempt comparative studies of the major Upanisads and early Buddhism as preached by the Buddha himself and then identify the points or mutual contact between the two systems.